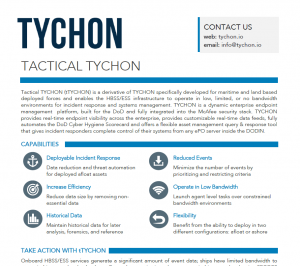 Tactical TYCHON (tTYCHON) is a derivative of TYCHON specifically developed for maritime and land based deployed forces and enables the HBSS/ESS infrastructure to operate in low, limited, or no bandwidth environments for incident response and systems management. TYCHON is a dynamic enterprise endpoint management platform, built for the DoD and fully integrated into the McAfee security stack. TYCHON provides real-time endpoint visibility across the enterprise, provides customizable real-time data feeds, fully automates the DoD Cyber Hygiene Scorecard and offers a flexible asset management query & response tool that gives incident responders complete control of their systems from any ePO server inside the DODIN. Use tTYCHON to leverage HBSS/ESS and allow for data reduction and threat automation for deployed afloat assets – ships at seas – and land-based forces deployed. Use tTYCHON to reduce the number of events returning to ePO Server by prioritizing and transmitting data that matches certain criteria. Use tTYCHON to reduce the overall size of event data by remove non-essential data from the data sets that get inserted into ePO Server under normal operating conditions. Use tTYCHON to launch agent level tasks to deployed assets and additionally perform forensics and response actions through command line interface over constrained bandwidth. tTYCHON retains all historical data and exports this data to the ePO server at a later date for further analysis, forensics, and historical reference.